Taylor Gang boss Wiz Khalifa releases new music with Atlanta's Gucci Mane titled "Real Rich". Wiz Khalifa has been feeding the streets with a ton of new music over the past couple months. From his own records like “Hunnid Bands” & “4/20” freestyle to lending out features like “Paul Masson” with Fresh & “Mary Jane”. Wiz meets Wizop. 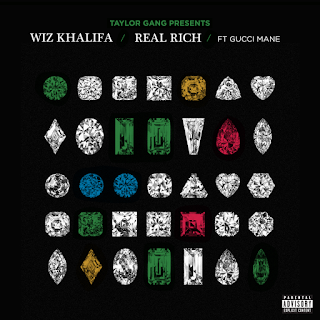 Before rolling out Rolling Papers 2, Wiz Khalifa unleashes his new single “Real Rich” featuring Gucci Mane. Over a thumping instrumental, Mister Cap raps about his wealth.